A big problem almost any robot nowadays has is limited agility. While this isn’t an issue for industrial and other “practical” robots, humanoids can only move in a slow, mechanical and chopping motion. Honda’s Asimo, for example, is considered super-advanced, but doesn’t move too elegantly either. But Japan-based Himeji Softworks raises the bar in that area. Their JO-ZERO robot kit shows we haven’t reached that Nureyev level of elegance yet either, but it’s pretty impressive, especially since it’s the brainchild of a small venture. It can break-dance (sort of) and pull off a number of cool stunts. One of the key points is that JO-ZERO’s back is bendable, which is not only quite unique but obviously boosts agility quite a bit. He has a total of 20 joints (four in each arm, five in each leg and two in the back) and weighs just 800g. 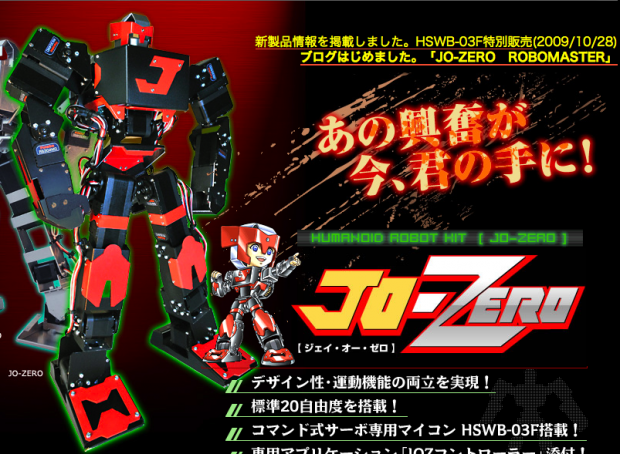 JO-ZERO stands 30cm tall. You can program him by yourself (Nakamura-san, his inventor, says it’s pretty easy) and remote-control him via infrared. His price: $1,300. This video show how JO-ZERO moves (it gets better later). This is one amazing robot.